We supply a advanced range of lux meters, which is used to accurately measure brightness in industries and research and testing labs. Our lux meters are highly regarded for their ease of use and solid design. 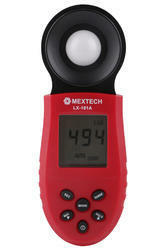 We provide compact and light-weight Lux Meter LX101A to our customers at competitive prices. Provided with LSI-circuit, LCD display, separate light sensor and low battery indicator, these meters consumes less power and are highly cost effective. These meters use exclusive multi-color correction filters and photo diode to provide accurate and precise measurement with optimum durability and reliability. · Accessories: Instructional Manual, 2pcs AAA Size Batteries. · Operating Temperature Humidity: 0°to40℃ ＜70%R.H. Our clients can avail from us Digital Lux Meter LX1010B which is in compliance with set industrial standards of quality. This light weight and advanced Lux Meter can measure wide range of in brightness and is used in photography, construction, inspection and greenhouse gardening. This Multirange Lux Meter is a Complex Delicate Instrument. Its Ruggedness with Allow Many Years of use If Proper Operating Techniques are Developed. · Accessories : Instruction Manual, Carrying Case, 9V Battery x 1pc.